Today at homify, we are going to bring you a little bit of sunshine! Because we all need a little bit of sunshine in our lives. 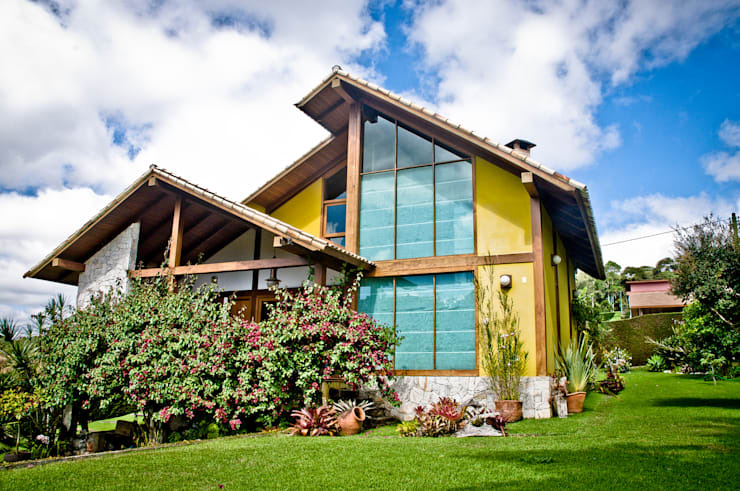 This beautiful, bright home that's inspired by a sunflower has been designed by these brilliant Brazilian architect professionals and is set in a beautiful mountainous region. It's a home that will bring you joy, just by looking at it. Let's go and look at some sunshine! 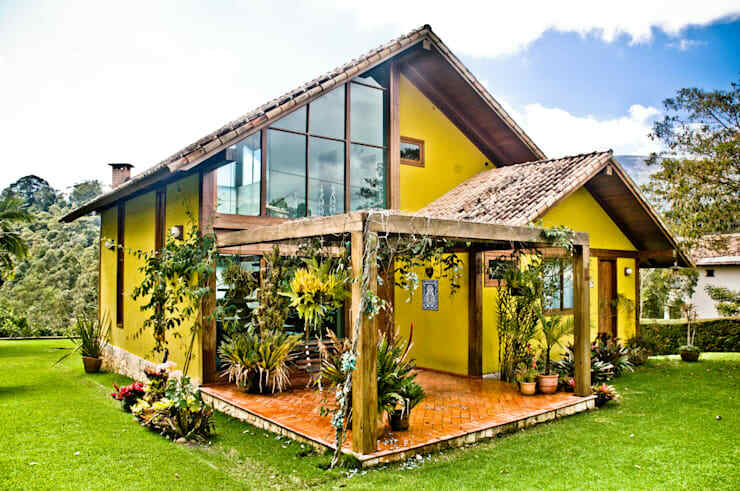 From the get go, we can see just how beautiful this home is, with it's bright yellow facade, abundance of flowers, large, glass windows and modern structure. How could you ever be sad looking at this home? We can see that the architects have gone for a very open and bright design. Apart from the colourful facade, there is a large open patio, large glass windows and lots of doors, allowing the interior to spill out onto the exterior. Nature obviously plays an integral role in this design. If we zoom in on the patio, we can see just how much character and charm this home has. The patio makes use of ceiling beams, or a pergola, which has allowed the designers to hang flowers and plants from all angles. This creates a beautiful effect. If you sit on this patio and soak up the sun, you will feel like you're in the middle of a forest. The designers have placed a very simple bench in this space—the perfect place for sipping coffee in the morning or reading a book in the afternoon. Don't you love the charming rustic quality that this space takes on? The back garden is just as charming as the front of the home. 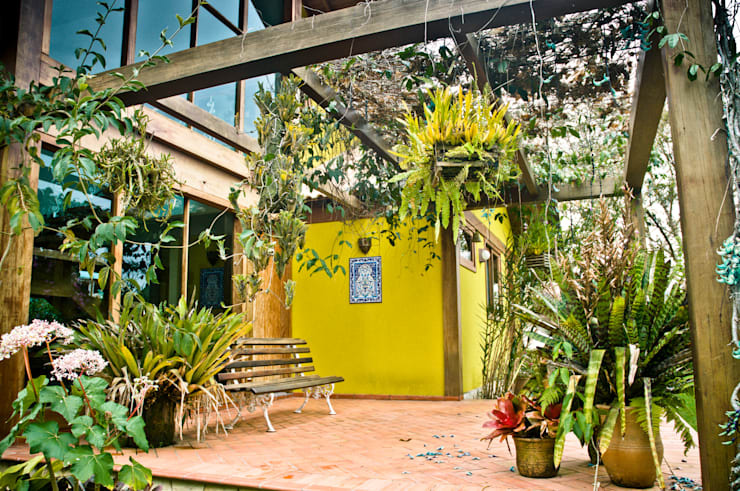 The bright yellow house flows out onto a large garden with a manicured lawn and beautiful, lush plants and trees. While a yellow facade may look a bit jarring in a city landscape, in this country setting, it just works so well. You'll also notice that the designers have included some very strategic outdoor lights throughout the exterior of the home. This allows the family to play games on the lawn or even host a braai in the evening, without worrying about the sun setting. Have a look at these outdoor lighting ideas for modern homes. 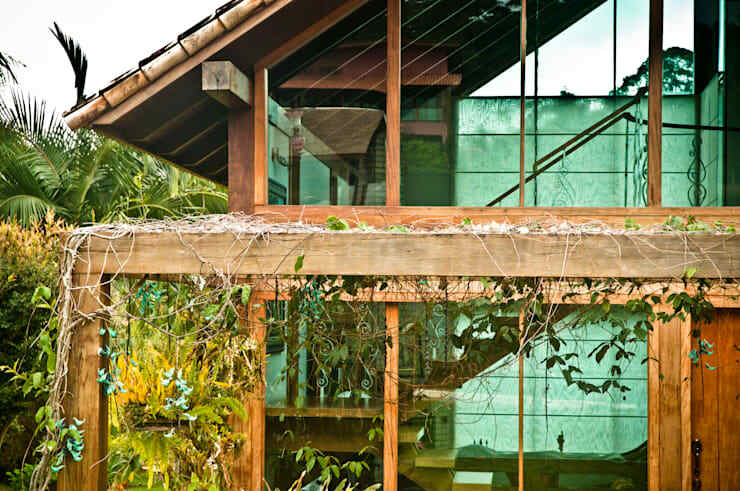 If we zoom in on this home a little bit, we can see how glass is a big feature in this design. Not only does glass as a material work incredibly well for the facade of a home but it also allows sunlight to filter into the space, creating a very warm and cosy atmosphere. Glass also allows those inside the house seamless views of the surrounds. If you're looking for a more sustainable or eco-friendly home, speak to design experts in your area about double-glazing and its benefits. Also have a look at this ideabook on: Minimal, eco-friendly family living. Wood is also a wonderful material for a home, whether it is used inside or out. 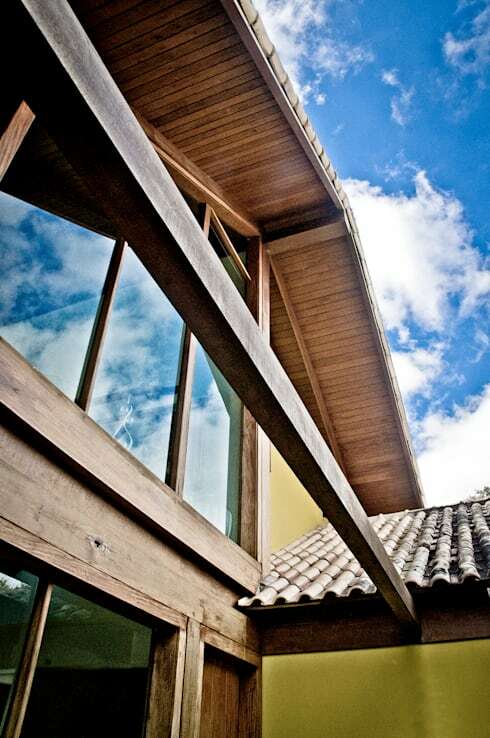 Wood can be used for window and door frames, the doors themselves, artfully placed yet functional beams and the roof. You can also go for a very light wood or a much darker wood, or paint wood a colour that you prefer. There are so many options when it comes to this material! Remember to opt for wood if you want a home that exudes a warm and earthy ambiance. It's particularly good for a country home! Would it make you happy to live in this bright home?